A student is taking his former fraternity to court over allegations they forced him into a brutal hazing ritual that left him reeling with brain damage and memory loss. Blake Novacek, the son of Dallas Cowboys star Jay Novacek, says he was knocked unconscious after being pounded by a baseball bat in the stomach. 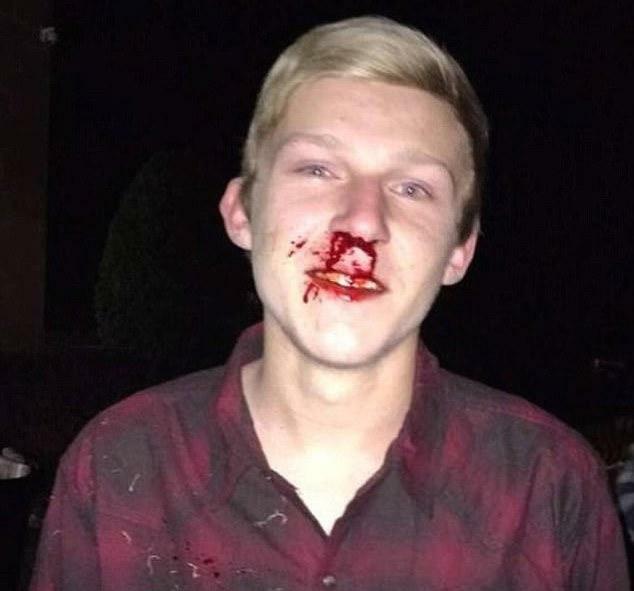 The 20-year-old was a student at the University of Oklahoma pledging the Beta Theta Pi fraternity – he had to drop out of school because he was unable to recall basic information after the beating. 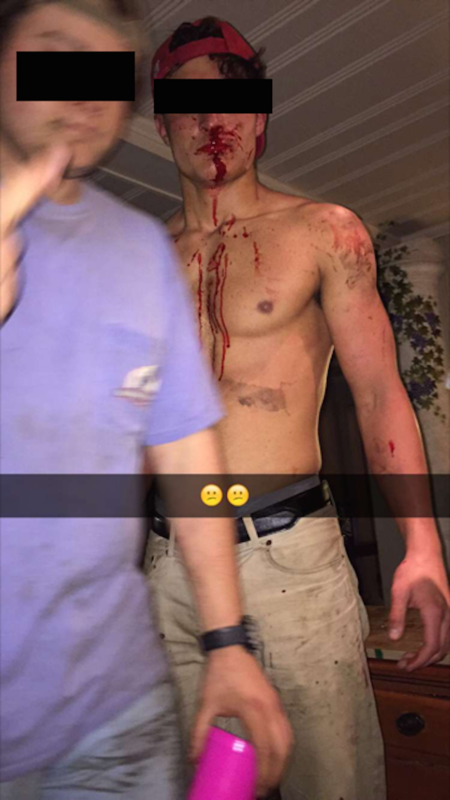 Now living with his parents in Texas, he is suing Beta. 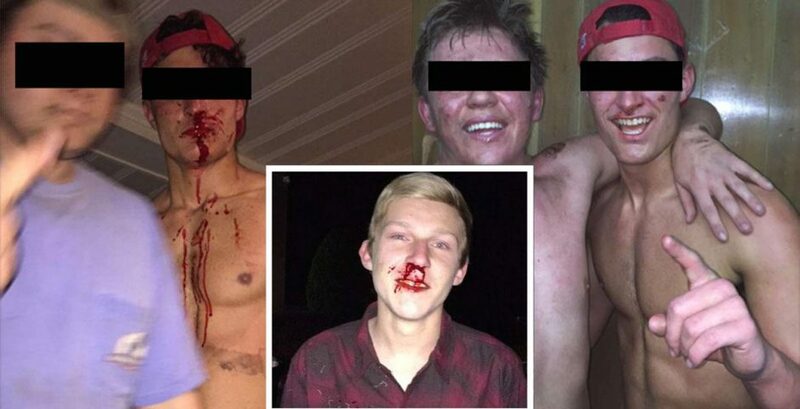 Today photos of the alleged hazing have emerged from the same fraternity. 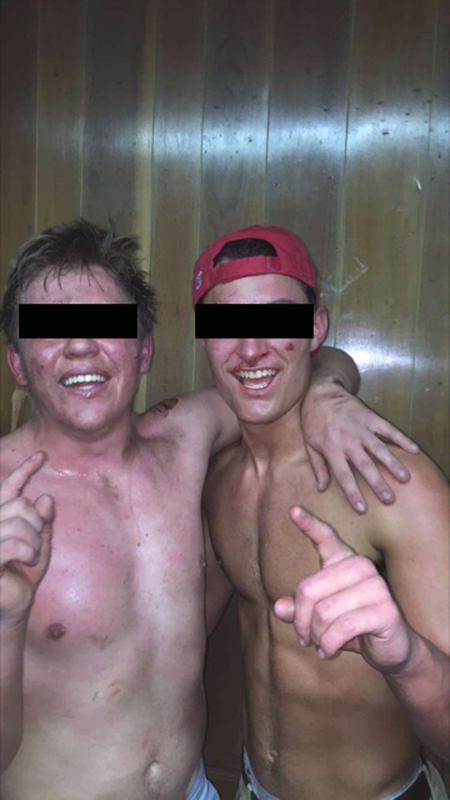 They show brothers taking part in a fight club pledging ritual – be warned, they contain scenes of violence and blood. Blake's lawsuit says the hazing occurred in October 2015 when an older brother named Shane Muselmann led him into a room and showed him videos of hogs being slaughtered. 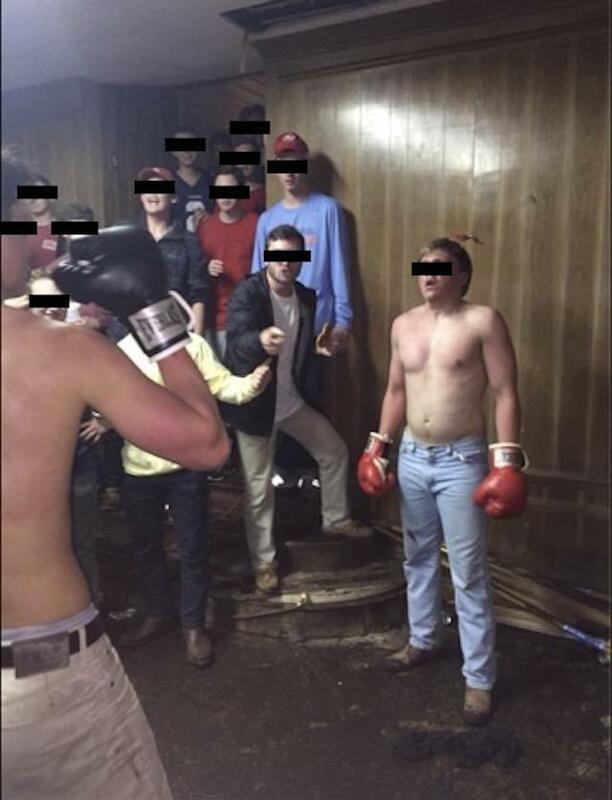 According to the legal claim, Muselmann then forced him to recite facts about the fraternity after watching the video, and would hit him in the stomach with a baseball bat if he got something wrong. This caused him to fall over, hit his head and pass out, he told lawyers. Blake says he regained consciousness 10 hours later on a frat house couch, his clothes cleaned and folded next to him. He says he does not know if he lost blood during the hazing. In the weeks and months that followed, he said pledges threatened him to stay quiet about the incident, according to the lawsuit. 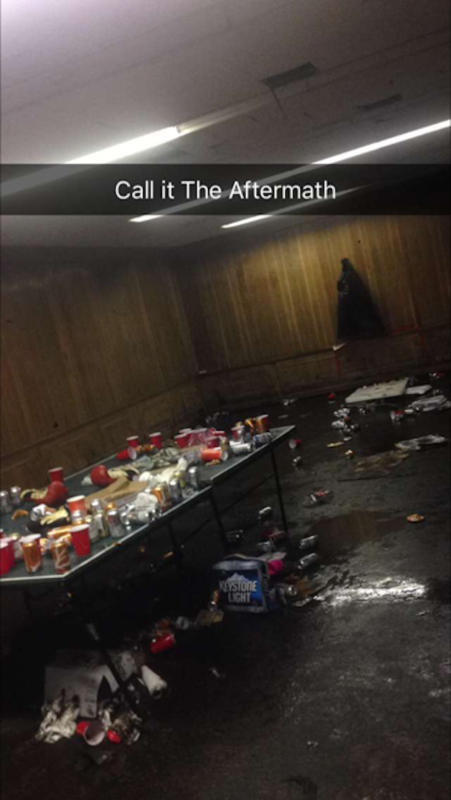 Fraternity brothers warned him against speaking out, saying they would trash his family's reputation. Blake says brother Gavin Martindale threatened him with damage to his reputation and property, and get him kicked out of school. Months later, his car was allegedly vandalized after an unnamed fraternity member told him not to go public with his injuries. But when his memory began to deteriorate, he told his parents. His lawyer, Christopher Cooke, says Blake is now unable to remember facts like his social security number. It has left him afraid of his future, as his memory loss could impair him from keeping a job. "What we're looking for is not only a change with this fraternity, but a change with fraternities nationwide. This sort of stuff goes on at almost every school and we have to put a stop to it. We've got underage kids drinking and participating in hazing. That's not what fraternities are about, fraternities are about friendship so we want to change the culture. "Every one of the pledges are forced to participate in the fight club as part of the pledge ritual – you've got broken noses and blood everywhere. When parents sent their child off to college, they expect them to get an education, they don't expect them to get a beating." The fraternity deny allegations of hazing. "Since learning of this lawsuit, we have performed an initial investigation of Blake’s allegations and have yet to uncover any evidence whatsoever which corroborates the substance of his claims," President Zach Allen said in a statement given to DailyMail.com. "To the contrary, we have numerous witness accounts and other evidence which contradict Blake’s story and which question his credibility. Based on our investigations to date, we firmly believe Blake’s allegations are false and that his lawsuit is entirely without merit. "We are offended by these false and inflammatory allegations, and we will vigorously defend our fraternity, its members, and their reputations against this baseless lawsuit." Christopher Cooke dismissed Beta's statement, telling us: "You can say there was no hazing all day, but once you see the pictures, it's pretty damning evidence." Blake is demanding at least $75,000 from the frat, Muselmann and Martindale. A UO spokesman told reporters they do not comment on pending litigation, but said: "The university investigates every report of a violation of the Student Rights and Responsibilities Code." This comes after a similar incident at Penn State's chapter of Beta Theta Pi. In a hazing incident gone desperately wrong, freshman Tim Piazza was left to die after consuming huge quantities of alcohol and falling down the stairs. Read about the latest in Piazza's case here.